Perched on a corner lot in the coveted neighborhood of Majestic Oaks in Hampstead, a Pinterest worthy home sits on nearly half an acre. The interior of the home has been tastefully upgraded with exquisite wall treatments, millwork, and light fixtures. It's the perfect mixture of traditional design and stylish design. Near the beach, Intracoastal Waterway, and Hampstead Marina, The Cumberland design features an open floor plan in a family friendly neighborhood where you can have everything you want in a home. Having a stressful day and just need a break? This is the tranquil piece of property that will melt away all your cares. 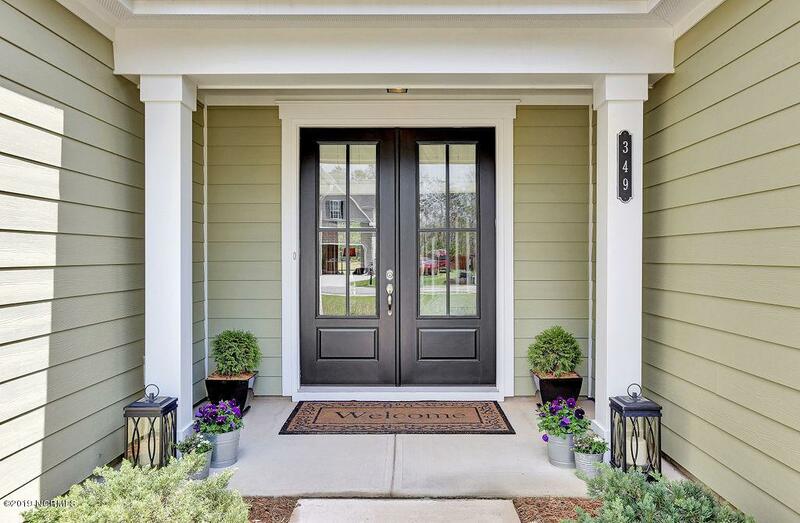 The exterior is classic and timeless in a soft olive green with black shutters and grand french doors, which deposit you into an open andairy entryway. 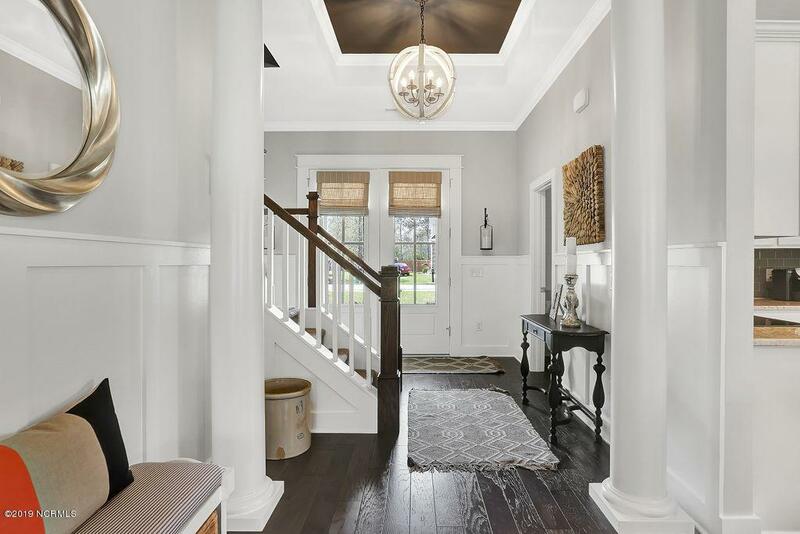 Accented by stately columns, custom board and batten wainscotting, and stylish light fixtures, the beautiful staircase will immediately catch your eye. The primary guest bathroom has been styled with shiplap walls for lovely coordination. Flowing into the open concept floor plan, the living room is light and airy. Eleven foot ceilings and massive sliding glass doors make for an impressive view. The space is very open and bright, with impeccable designs. 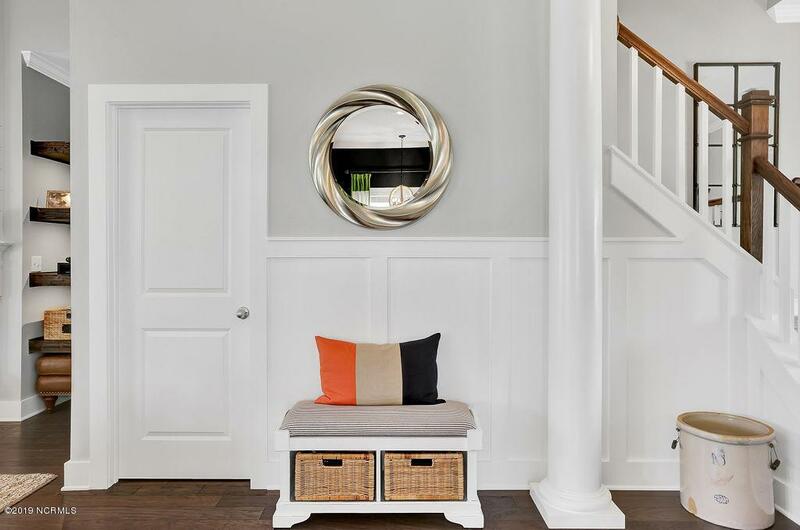 Of course, if it's not your style, a coat of paint can make for an easy change. A shiplap style wall treatment over the gas fireplace draws the eye up, while built-in shelving allows easy storage/display of books and knick-knacks. The formal dining room is set apart with an accent wall made of bold stripes in neutral tones. Swinging above the dining table is a gorgeous metal barrel chandelier. A wall of three tall windows creates a view more lovely than a prized painting, the best backdrop for a tablescape. The breakfast nook, kitchen, and living room flow together seamlessly, creating an area so spacious and enjoyable, you'll never want to leave. Elegant crown molding and wide plank wood floors are complemented by industrial pendant lights and crisp white cabinets. The kitchen island is massive, with marvelous board and batten millwork and granite counter tops. The chef in the family will love all the counter space. Sandy shaded backsplash reminds you the beach is calling. There's an abundance cupboards and drawers. Finally a kitchen with enough space to store all your food prep tupperware without it toppling out! The dark kitchen walls enhance the separate space, without limiting it. The light fixtures coordinate beautifully without being matchy-matchy, clearly demonstrating the high end design work. Sunshine streams through the many windows, keeping the entire space cheerful and bright. You will love the rustic orb chandelier over the breakfast nook, which is positioned next to the kitchen and features board and batten walls and more of the striking paint treatment from the kitchen. At a whopping 3,116 square feet with four bedrooms, there is space for everyone. Three of the bedrooms are located on the main floor, including the master bedroom. It's a delightful retreat with a tray ceiling and walk-in closet. The master bathroom is beautifully styled with a tiled shower, separate soaking tub, and incredible corner vanity. There is so much counter space on this vanity. Board and batten wainscotting with tiled trim elevates the custom space. Two more bedrooms, a full bathroom, and a half bath complete the first floor. The second floor is incredibly spacious as well. Butter the popcorn and gather the family because the room upstairs would make an excellent media room. Or make it a playroom, craft room, man cave, or even a library. A fourth bedroom and full bathroom give you so many possibilities for the second floor. A small study or office is well suited for the space at the top of the stairs. Back downstairs, grab a glass of sweet tea and head to tremendous screened in porch, where you are likely to hear the sounds of twinkling laughter from children riding by on their bikes and scooters. Wave to neighbors walking their dogs and relax to the chirp of crickets. 349 Weir Dr was made for enjoying laughter and creating memories for years to come. A two car garage features an upgraded epoxy floor. A stunning hand painted mural with a woodsy feel was designed in neutral tones, adding interest to the wall over a conveniently positioned coat rack by the garage door. Majestic Oaks is a coveted neighborhood for good reason. The streets are lined with sidewalks and street lamps. The community pool with a club house is an absolute delight in the summer months. 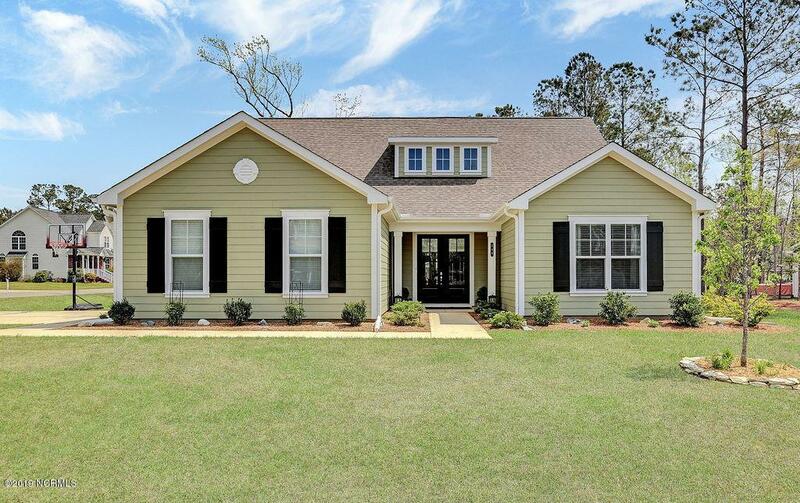 Located in the esteemed Topsail School District, this stunning home is just minutes from the sandy beaches of Topsail and a short jaunt to Wilmington and Camp Lejeune. Call me today to arrange a showing of 349 Weir Dr.